Glam Morena: Haul/Swatches: L.A. 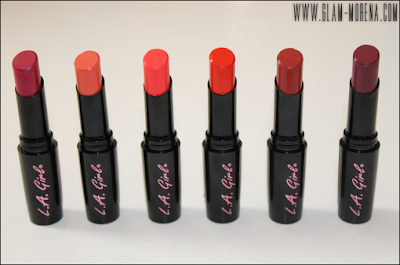 Girl Luxury Creme Lip Colors. Haul/Swatches: L.A. 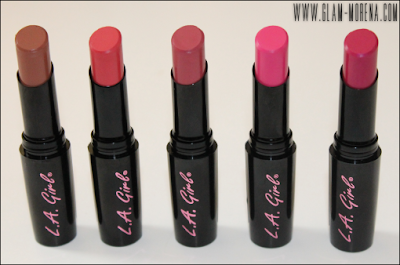 Girl Luxury Creme Lip Colors. I ordered some new lispticks from MizOutlet a couple weeks ago. The lipsticks I purchased are the L.A. Girl Luxury Creme Lip Colors. I have tried these out before and I liked them a lot! I picked up eleven new shades. Here's my entire L.A. Girl Luxury Creme Lip Colors haul! Description: Ultra rich lip colors, applies on silky smooth for the softest, sexies lips ever. Luxury Creme Lipstick delivers ultra rich colors in a lightweight formula. Its blend of moisturizing ingredients of aloe, she butter & vitamin E enhances lips, leaving a smoother, healthier feel. Glides on effortlessly with the slant tip, for a flawless, even coverage. Be sure to watch the video for an up close of each shade! I included some swatches of the L.A. Girl Luxury Creme Lip Colors below! Have you tried the L.A. Girl Luxury Creme Lip Colors? Thoughts? Favorites? im loving al the shades they are beautiful!